A cup of good coffee can make your day. However, unsavory coffee experiences can dent your mood and ruin it for you. If you saunter over to your Keurig coffee maker in the morning, only to find it behaving oddly, chances are you’d be shaken off your sleep in the wrong coffee. From the machine refusing to switch on, to observing the surprisingly little amount of coffee coming out of the machine, it could be anything. There are turn downs such as water leakages from the machine, and then there are sheer catastrophic events when the coffee starts tasting odd. If any of these happen to you, some troubleshooting knowledge will come handy. 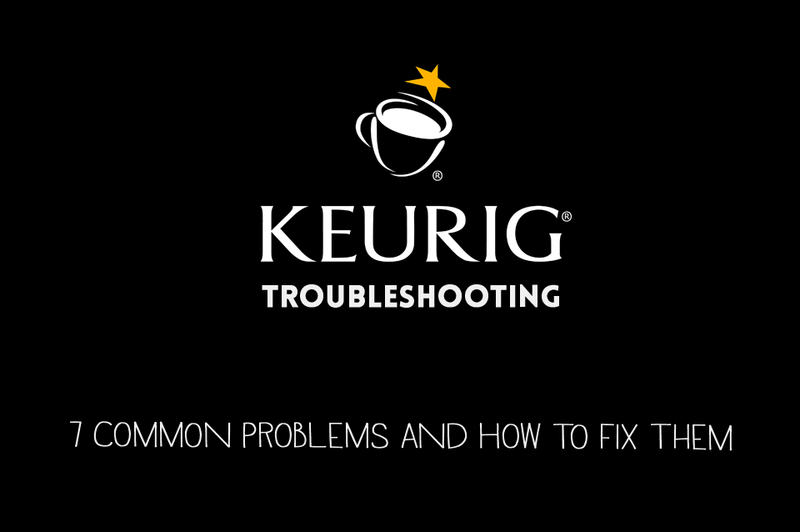 This is where we suggest you know more about the most common problems faced with Keurig coffee machines. Solutions: It’s troubling when your coffee maker refuses to do that one task you bought it to do – that is, brew some coffee. Hopefully you can find a solution to get you back in business using one or more of the following suggestions. Your first option would be to run the machine a few times without the k-cup. If you believe there’s calcium scaling in the machine (could well be the case if you’ve been using it regularly for more than six months), here’s a trick. Either purchase some descaling solution or Mix some vinegar drops in water and soak in the machine for 45 minutes. Then, flush out the vinegar water, and give a thorough cleansing to the machine with fresh water. This removes calcium scaling. Give it a shot and see if it works. Disclaimer: This is not recommended by Keurig. Also, switch off and unplug the machine, and clean the dispensing line with something like a paper clip, to remove leftovers of coffee grounds. Another method is to blow air into the line using a straw, to give it a cleanup. Fill the water reservoir to the brim, switch off and unplug the machine, and give it a few gentle shakes. This ensures that there remains no trapped air in the machine, which could otherwise interfere with the brewing. Quickly check if all components are at the right places, and seated properly. It’s not uncommon for magnetic water reservoirs to lose their alignment, so just check. Are you sure you are allowing sufficient warm up time? Without sufficient warm up time, water won’t get hot enough for a good brew, leaving very little and insufficiently brewed coffee. Solution: Not a great beginning to the day, to find your coffee maker refusing to switch on in the morning. Once the Keurig coffee maker is plugged in and you hold the power button, you see the power icon appear in the right bottom part of the touchscreen display, along with a welcome note. If it is not so, you’d need to check if it’s a problem with the touch screen or the machine itself. Unplug and plug back the machine and repeat, just to be sure. If it doesn’t work, try with a different power outlet. If it continues to be a problem, time to contact Keurig customer care. Solution: If your Keurig machine is turning off on its own, or turning on without your command, chances are the inbuilt timer has been set. Keurig Mini: If the brewer remains sedentary for more than 90 seconds, it turns off on its own. You’ll need to press the Power button to start it again. Keurig Elite: Check if you see the Auto Off light indicator (green) illuminated. This suggests that the brewer will switch off automatically 2 hours after its last brew. If you want to disable this auto switch off, press the Auto Off black button, which will turn off the green light. Special Edition and Platinum: Again, if Auto Off is set, your brewer will shut off on its own. To disable, go to Auto Off programming through the menu. The left button (small cup) needs to be pressed multiple times; it then says Off, which means ‘auto off’ is disabled. It’s unlikely that the machine will break down while brewing. However, if it does, we’ve got you covered. Often, the vibrations of the machine cause the water reservoir’s magnet to get dislodged, which interrupts the brewing cycle. When this happens, all you need to do is to set the reservoir’s magnet in its correct position. Resume the brewing, and see if the problem is sorted out. If even this does not solve the problem it’s time to talk to customer care. Solution: Often, clogging of water line of your machine causes a significant reduction of coffee you get out of a brewing cycle. Clogging of water lines in coffee maker machines is common because most machines have fragile water lines. If your Keurig machine is not brewing the amount of coffee you expect, the chances are that debris and coffee grounds have clogged the water line. The solution, thankfully, is simple enough. Operate the brewing cycle a few times with just water, without the k-cup. Also, clean the needle to take out the extensive grounds and debris. After unclogging the water line, you should start getting the full dose of coffee like before. Solution: Observing inadvertent leaks around your Keurig machine? We know, it can be pretty irritating and can take the kick out of your morning coffee, since you see a mop-up job lined up. This happens because the upper gasket of the machine can either go missing. Inaccurate installation of the gasket also causes this problem. The gasket is placed around the puncture needle of the machine. So, if you see leakages, check if it’s in the proper place. If it’s missing, you’ll need to purchase one. If it’s still there, you’ll need to adjust it so that it forms a perfect seal with the incoming water supply and the k-cup. Any misalignments, and you’ll see leakage pretty soon. When the grounds also start leaking out, you can imagine the mess it’ll make around your Keurig machine. In most cases, moving the gasket down by a quarter of an inch does the job of closing the minute gap between the k-cup and puncture needle. Solution: Assuming you’ve not changed your coffee brand, there’s no reason why the taste should suffer. Often, the difference in taste is a result of the buildup of scaling inside your Keurig machine. Whereas advanced models give you an alert when the machine needs descaling, you’d do well to ensure you do a thorough clean up every 3 months, or even sooner if you use your coffee maker very regularly. More than a Keurig specific problem, this is a user maintenance issue that could crop up with any coffee maker. If you use regular water in your brewing, the formation of scales in the brew line will be speedier than when you use filtered or boiled water only. The mineral build up impacts the taste of the coffee badly. You get de-scaling products to clean your coffee maker. A home remedy (vinegar water) has already been highlighted in the solution to problem #1. Problem 7: I see an error message that reads something like “add more water”. Solution: Fill the water reservoir to maximum and check again. If the error message persists, here’s what you can do. Take the reservoir out, and clean it thoroughly using soap, and drying it by patting with a non-abrasive cloth. These reservoirs aren’t dishwasher safe, so you’ll need to do the cleaning by hand. Now, fill it again to the maximum level, and make it seat properly in the machine. Once done, check if the error message is gone. If it persists, it will serve you well to report it to customer care. If you tried everything listed above and are still experiencing problems please feel free to contact Keurig customer care. Their phone number is: 1-866-901-BREW (2739). That support line is toll-free, and is available 7 days a week from 7 am – 12 am EST. You can also find a contact form here. We here at Freshpresso hope that you are able to diagnose your Keurig problems and can get back to drinking amazing coffee! Happy Brewing! If you are fed up with your Keurig and want to try something new, please check out our other coffee machine reviews and espresso machine reviews. Also, if you want to step up your coffee game take a look at our coffee grinder roundup. Thanks!